Popples is a Saturday morning cartoon, based on the Popples toys, that aired in the United States from 1986 to 1987. The pilot was a live-action Shelley Duvall special, in which they were puppets and marionettes; after this was well-received, it was decided to make a cartoon series with the same characters. The cartoon was produced by DiC Entertainment and LBS Communications and animated by KK C&D Asia, Madhouse (yes, that Madhouse), Studio Korumi and Studio Shaft. It was also made into a line of toys in 1986 by Mattel. The idea for the franchise came from rolling up socks. The name "Popple" is a reference to the popping sound they make when unfolding themselves from such a ball, or in the cartoon, pulling objects from their pouches. Nine of the Popples live with a human brother and sister, Billy and Bonnie Wagner. Billy and Bonnie think they are the only kids who have Popples until a neighbor family moves in and they have their own Popples — the Rock Stars, Pufflings, and Babies. Two very late episodes feature the "Sports" Popples. The Popples tend to come around and mess up whatever the kids are trying to do; e.g., if the kids are trying to brush their teeth, the Popples end up spilling water, toothpaste and soap all over the bathroom. If the kids are trying to clean their rooms, the Popples come along, mess up the room even worse and then help them get everything back to normal just in the nick of time. The plot revolved around the children's efforts to hide the existence of the Popples from the adults around them. Popples commonly pull large items from their pouches that couldn't possibly fit inside, which come from hammerspace; in "Popples Alley", Bonnie looks inside Puffball's pouch and sees numerous objects floating in a void. The oddest part of this is that Saban Brands has green-lit a reload to air in 2015. While we might not have the Original Nine, we are probably in for more Chaotic Neutral fun. It did indeed come out on Netflix in 2015, and the trailer can be watched here . The main difference between the old series is taking place in a world inhabited entirely by Popples, and none of the original characters returning. Added Alliterative Appeal: All of the Popples' names (except for the Baby Popples, and the Sports Popples) begin with a "P". In "Backyard Adventure", It is one of the Popples trying to scare the others. In "Pop Goes The Radio", Putter asks the audience to look for goggles in his pouch, before some hit him in the head. In "Backyard Adventure", P.C. does this. In "Popples Alley", before Bonnie looks into Puffball's pouch, Puffballl says "Hey kids! Come here! I've got something to show you!" In the first season, the characters broke the fourth wall at least once per episode. In one episode, a baseball "breaks" the viewer's TV set. This happens a lot in season two. If the Rockstars sing a song that is not made up by the Rockstars or isn't a marching song, camera abuse is bound to happen. For example, in one episode, they sang Row Your Boat, and in another, they sang Rockabye Baby. Episodes which are exceptions include "Funhouse Folly" and "Fixer-Upper Popples". Gratuitous Japanese: In one episode, it sounds like Bibsy is saying "omocha" when pointing to a cuckoo clock. "Omocha" means "toy" in Japanese. Popples pull out things too large to fit inside their pouches (ex: anvils, elephants). In one episode, Pretty Bit says "I've got nothing but a pouch full of stuffing", referencing hammerspace. Popples Alley has a scene about Hammerspace. Putter said "Look into my pouch!" in Pop Goes The Radio. "Party! Get your hand out of my pouch!" Metal Scream: The Rock Star Popples sometimes do this during their songs. "Row! (ROW!!) Row! (ROW!!) Row your porch! (ROW YOUR PORCH!!) Gently up the stream! (GENTLY UP THE STREAM!!)..." Mini-Golf Episode: In "Popples Play Pee Wee Golf", Billy and Bonnie want to buy a birthday present for their mother but have only seven dollars to spend on it. When Billy notices the local mini-golf course is offering a twenty-five-dollar prize to whoever makes a hole-in-one and, in spite of his sister's reluctance, they enter the golf course and lose the money. Two dollars on entrance fees and the rest on snacks for the popples. In the end, one of the popples scores a "hole-in-none" by jumping into a hole and the Wagner siblings give their mother a certificate for a free play at the mini-golf course. Nobody Poops: Averted in "Museum Peace", in which the Pufflings drop an egg on one of the Popples. The Baby Popples also don't wear diapers. This may be because of this trope, or probably because they may have been potty-trained. 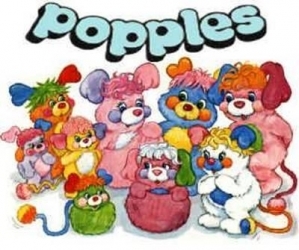 Out of Focus: In Season 2, a significant amount of attention was given to the new Popples. While P.C. and Party were still prominent, usually only one or two of Billy and Bonnie's other Popples would appear in any given episode. Pancake got hit hard by this in Season 2. Other than the opening credits, she appeared only in the first episode of the season (which featured every Popple, as it was the one where Mike and Penny moved in next door), and even then, she only got to say one lousy word (her own name). Puffball nearly suffered a similar fate, except that she managed to have a decent role in "The Repair Shop". Interestingly, that was the only Season 2 episode to not feature any of the newer Popples. Product Placement: In the live-action pilot, Goodwill plays a major role, because Billy and Bonnie did not want their Popples to go there. Smuggling with Dolls: Accidentally Invoked toys themselves. The doll came with a hidden interior pouch to be used to fold the Popple into a little ball. In practice, Popples dolls made great contraband storage. In the episode "Treasure of Popple Beach", it plays in the background when the Popples try to find a way home. This happens again at the end of "Poppin' at the Drive In". One of the pieces of background music sounds like a peaceful, slowed down version of the intro. Verbal Tic: Most of the time, they emphasize the "p" anytime they "p-p-p-pronounce" any word beginning with "p" (except for their own names).